Tony's Movie Reviews for March 31st, 2017 "The Boss Baby," "The Zookeeper's Wife" and "Ghost in the Shell"
“The Boss baby” is a deceptive film if you're basing your movie decision on the promos for the movie, but it is actually well worth seeing. This animated film probably won't make you forget any Pixar classics, but the film does have a good sense of humor and is very well paced. If you were a fan of more modern animation like “Animaniacs,” you'll feel right at home with the film. “The Boss Baby” is one of those films you can take the kids to and laugh with them. It gets a B and is rated PG. “The Zookeeper's Wife” tells the account of keepers of the Warsaw Zoo, Antonina and Jan Zabinski, who helped save hundreds of people and animals during the German invasion. Based on a true story, the film focuses on how, after losing everything, the couple decide to use their zoo to hide and help move Jewish refugees to safety as the Nazi's begin to close in. Jessica Chastain provides a deeply moving portrayal of a woman who rises to protect her neighbors agains a great wrong. I hope the Academy will remember her at Oscar time. 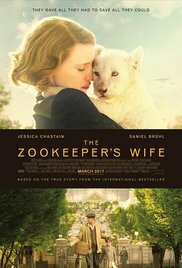 All in all “The Zookeeper's Wife” is a story well worth experiencing. Somewhere in the future man discovers how to transplant a human mind into an artificial body, thereby creating a hybrid. After suffering a near fatal accident, a young woman named 'Major' finds her brain is put into an android body and becomes a perfect weapon to battle the bad guys. But Major is missing several important pieces of her past and will stop at nothing to figure out who she really is. “Ghost in the Shell” is not only a rip-off of several films we all know, including “Robocop,” “Blade Runner” and “Total Recall,” but a poor rip-off at that. With a lackluster and overly confusing script, “Ghost in the Shell” is a total misfire. If you'd rather watch "Robocop," "Blade Runner" or "Total Recall," get over to dvd.netflix.com and start your FREE trial now! Check out their incredible library!